This week we bring Korean BBQ to the UK!! You can find Korean BBQ her but it’s not the same, and so many of our friends hadn’t tried it that we decided to make our own authentic Korean BBQ with them! Juicy Pork Belly, grilled kimchi, incredible ssamjang sauce and the perfect mix of veg combining to make an experience you won't forget. Meat will never taste the same after you try legit Korean BBQ... there's no going back. 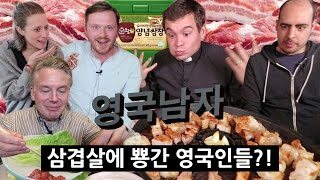 김밥을 처음 먹어본 영국인들의 반응? !